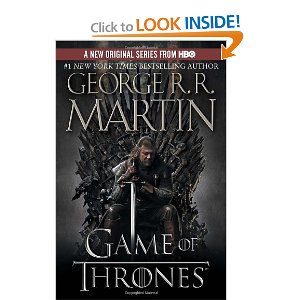 Games of Thrones is the first book in the epic series of a Song of Ice and Fire by George R. R. Martin. Last season HBO brought the first book to life ( Games of Thrones) on Sunday nights at 9pm. I did not watch the first season. I watched the first season in February on HBO on demand; it was great. I went to Barnes and Nobles and bought the book on CD. I love to listen to audio books. 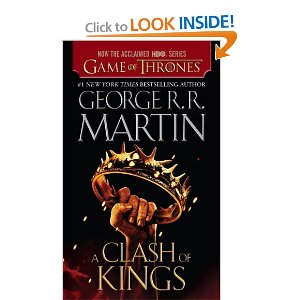 Once I finish listening to Games of Thrones I bought the second book on CD in the series " Clash of the King". Clash of the Kings is the second book in the series and its also the second season on HBO. I bought A Storm of Swords in audio book. 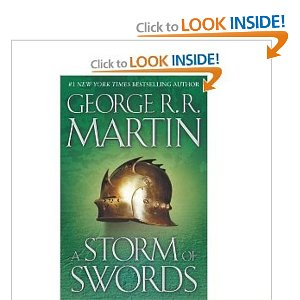 I decided to listen to this book during the summer and before the third season starts on HBO. If you are not watching this series you are missing a treat. Warning: for adults only. Alethia, I absolutely love the HBO series. I have yet to read the books. No you have me thinking .... BTW I hope your neck/back is feeling better and have no more migraine headaches.